We’ve covered reverse graffiti in the past on Inhabitat – a practice which involves creating street art by cleaning soot covered surfaces to inscribe them with images using scrub brushes, scrapers and pressure hoses. 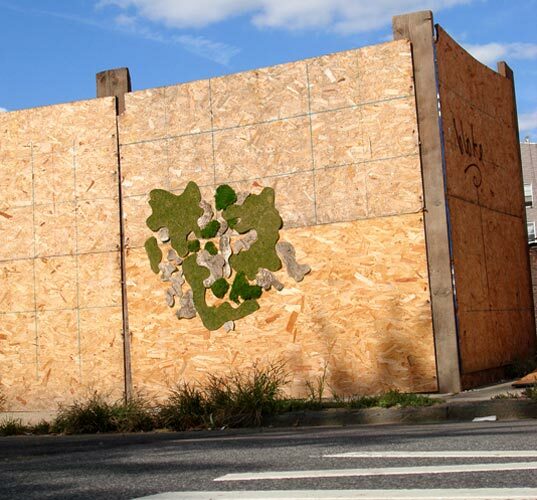 Now in Brooklyn we’ve discovered ‘living graffiti’ — an idea which takes the idea of clean graffiti to the next level by creating street art out of living, breathing plants. Edina Tokodi studied graphic art and design at the Hungarian Academy of Fine Arts and also completed urban design course work in Milan, Italy. Her work can be seen on the streets of Williamsburg, Brooklyn and in unexpected outcroppings on a street near you. good!!good! !That’s great stuff! It would be cool to see an AK47 done in moss or some other thug stuff done in green fluff.hah !! Edina get a website up asap! I don't want to lose this, and I'd love to keep track of where you go next with your art. Im a Graffiti writer from Rio and I also work with sustainable materials... This work is a great start point to go in the sustainable graffiti direction, something that i always dreamed about. This work sure is graffiti, and who is saying it isn`t don't have enough knowledge to talk about it!!! Sorry to burst your bubble, but that is not graffiti. THANK YOU FROM THE BOTTOM OF MY HART. IVE SEEN WHAT IT USE TO LOOK LIKE AND NOW WITH THIS MAYBE WE ALL CAN FOLLOW. P.S. IM SORRY THAT I USETO BE A GRAFFITI ARTIST THAT USETO PUT IT ON PEOPLES WALLS WITH OUT PERMISSION, THAT GOES ALSO TO MOM AND POP STORES ALL OVER. "I'M SORRY." (NO IM NOT PUSSING OUT) LINK ONE BKLYN, PEACEOUT ONE LOVE! We've covered reverse graffiti in the past on Inhabitat - a practice which involves creating street art by cleaning soot covered surfaces to inscribe them with images using scrub brushes, scrapers and pressure hoses. 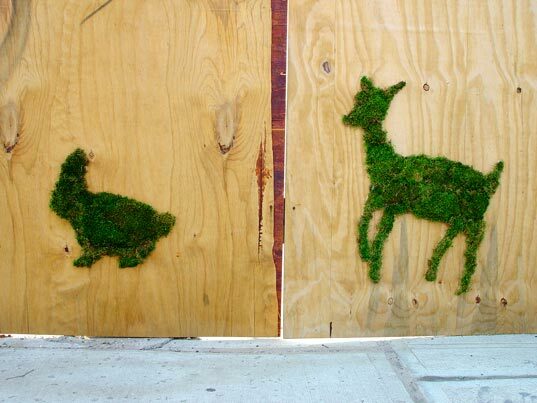 Now in Brooklyn we've discovered 'living graffiti' -- an idea which takes the idea of clean graffiti to the next level by creating street art out of living, breathing plants.